I usually buy a large roast that is on sale and cube the meat into stewing meat or stir-fry strips etc. and freeze them in portion sizes that I would use for one meal. You would be surprised as to how much money you are able to save if you do a little of the work your self. This stew has very simple ingredients with that, comes a good and flavorful homemade earthy goodness, better known as, "Good ol' comfort food". Start with a fresh salad, then serve the stew along with your favorite biscuit or bun and Applecrisp Cheesecake for dessert and your family will be very happy! Brown the beef in the oil, add onions and garlic til onions are softened. Add the beef broth, bay leaf and parsley. Cover and simmer until the meat is tender. Depending on the cut of meat it could be one hour to three hours. Add carrots and potatoes, cook 20 more minutes. Add the sauteed mushrooms, peas and beans. Add the cornstarch or gravy maker dissolved in a little bit of water, and cook til thick and the raw taste of the cornstarch is gone, about 5 minutes. Take off the heat and let stand for about ten minutes. Now is a good time to start with that salad. 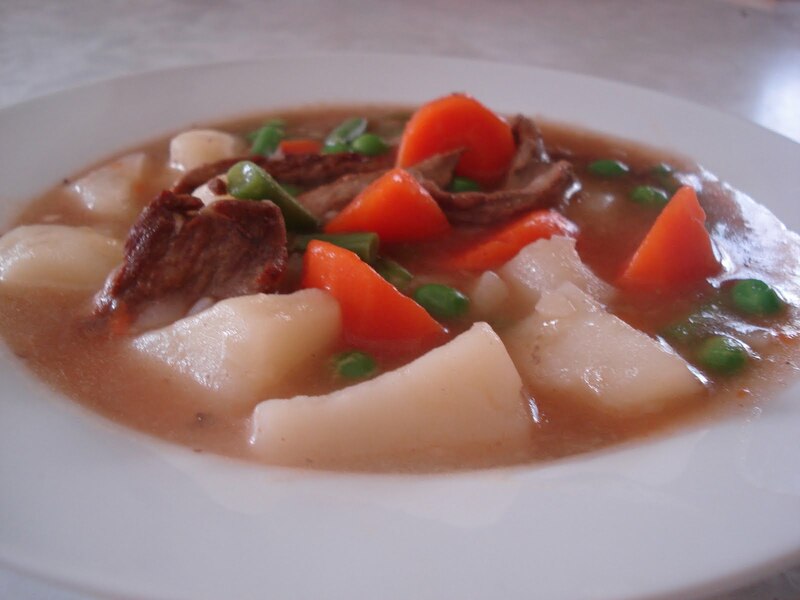 mmhmh this will be perfect for supper, there's no better way to warm up on a cold & windy day than with a stew - thank you for sharing this. You've inspired me. 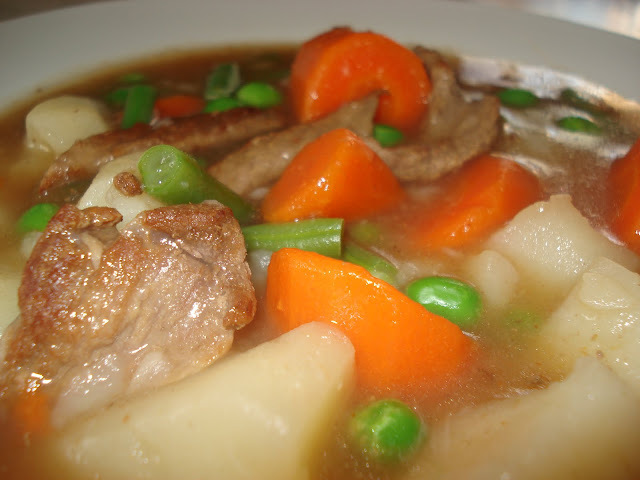 We're totally having stew tonight for supper ~ perfect for a cold, rainy day in Manitoba!! YES!!! - I will be making a Danish Seamen's roast...Old family recipe...this will be the perfect weekend for that with this beautiful fall weather. Your stew looks Devine! Mmmm..stew sounds pretty wonderful right about now. I am so glad the weather has turned and that is time for stews again. There is nothing more satisfying than coming home to a tasty stew! That stew looks fantastic! I think I need to make some stew again soon, the weather the way it is, it's the perfect all-in-one supper! I loved this recipe. I like that so many of the recipes are loaded with veggies....this one included! I have always wanted a basic beef stew recipe and this was the flavour I was looking for. I check in here often for recipes now that I discovered this web site and enjoy reading your personal blogs as well. Being a Cdn Mennonite living in Germany it is nice to have a connection with Cdn Menno ladies.